Some bad cars might be passed out as good cars despite honest intent. Review a car’s history report for free using its license plate number. The Illinois Secretary of State Office is another excellent source of Illinois vehicle information. For inquiries, you may call at 217-785-3000 (Outside Illinois) / 800-252-8980 (Toll-free in Illinois). You may also visit the Contact page. Drivers have 30 days to register their cars upon entering the state or purchasing a vehicle. Afterward, a temporary registration permit will be provided as you wait for your license plates. You can use the permit to drive up to 90 days or until your license plates arrive. The Secretary of State Office of Illinois is the official provider of license plates in the state. The state’s standard license plate must contain three letters and four numerical digits, while each car must display two license plates: one each for the rear and the front parts. Request for a replacement plate/sticker if your plate/sticker is damaged or missing. A replacement for one plate costs $6, while for both license plates it’s $9. Stickers cost $20 each. Your vehicle must be properly titled and registered under your name before you can request a personalized or vanity plate. The use of personalized or vanity plates for vehicles that are leased, in a trust, or registered by a business entity is prohibited. In general, you can process a license plate transfer to any vehicle that you owned. However, you cannot transfer the ownership of your license plate to another person or entity. Visit the Transferring Plates page for more information. Vehicle owners in Illinois may start their title application online through the Electronic Registration and Titling System. Upon completing the process, they may send their applications by mail or over the counter to a Secretary of State office. Make sure the details you will divulge are correct to prevent your request from being denied. If the vehicle is under nine years old, don’t forget to include your vehicle’s mileage at the time of submission. A title request may depend on the following documents: (1) Tax Form RUT-50 to transfer ownership, and (2) Tax Form RUT-25 for vehicles that were purchased from out-of-state dealers. A replacement for a lost or damaged title can only be issued after 15 days have passed since the original title was given, and after being acknowledged by the state’s DMV office. If it is a second duplicate request, it will take 30 days. If your title contains incorrect details, you may submit a request for correction, along with a signed Illinois Certificate of Title for authentication. Make sure all important persons have provided their signatures on the certificate. If the car has a lien, the title will be delivered to the lienholder because the DMV recognizes his or her preponderance. Otherwise, the main owner will acquire the title if a lien is absent. Buying a used car in Illinois? Don’t make a costly mistake. 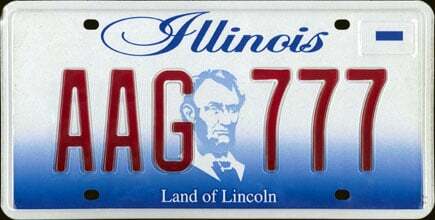 Run a Free License Plate Lookup for your Illinois-registered vehicle! Run a Free Illinois License Plate Lookup to uncover the full-story of your Illinois-registered vehicle.